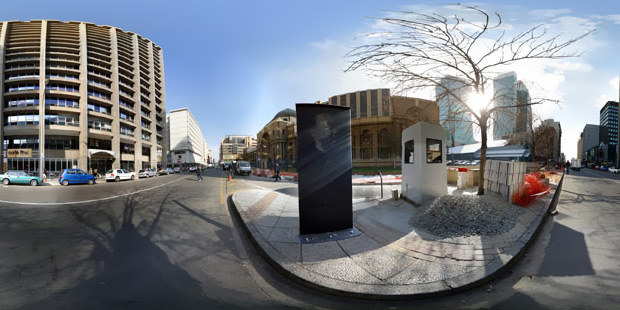 Installed outside the Johannesburg High Court on Pritchard Street, Lewis Levin’s two-metre-high homage to Duma Nokwe, the first black advocate to be admitted to the Johannesburg Bar, instantly captures the attention of passers-by. On March 9 1956 Duma Nokwe became South Africa's first black advocate at the Johannesburg Bar, beating his nearest rival, Nelson Mandela, to the honour. The Minister of Native Affairs, Hendrik Verwoerd, turned down Nokwe's application to have offices, known as chambers, in His Majesty's Building where the white advocates were housed. Fellow advocate George Bizos illegally shared his chambers with Nokwe from 1956 to 1962. In his autobiography, Odyssey to Freedom, George Bizos recounts how Ismail Mahomed joined the Johannesburg Bar a few years after Nokwe, and how non-whites were eventually admitted to the Society’s common room. In his autobiography, Long Walk to Freedom, former president Nelson Mandela writes about how the decision was made to use Duma Nokwe as the only advocate in the Treason Trial. An article published in The Friend reports on Duma Nokwe being denied access to chambers in His Majesty’s Building, and the Bar Council’s decision to take up the matter with the Minister of Native Affairs. In this opinion piece, the writer takes issue with Dr Verwoerd’s "undignified" and "arrogant" response regarding the necessity of Nokwe having to take up premises in a Native Area. In a letter to HF Verwoerd, IA Maisels, chairman of the Society of Advocates of Southern Africa, asks the government to reconsider its position on Nokwe being confined to a Native Area. In his response, via his private secretary, Verwoerd says "there can be no departure from the stand taken". This extract from the ANC’s website describes how Duma Nokwe "crossed into Bechuanaland" in January 1963, starting a period of active exile that would end with his early death at 50. Duma Nokwe might have had the honour of being the first black South African at the Bar, but the reality of practising as an advocate was a different story. Lewis Levin is a Johannesburg-based architect and sculptor whose work mainly focuses on urban-renewal projects. 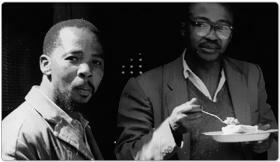 Levin says he was deeply moved by the life in one of Nokwe's photographs which led him to the concept of a "ghost" potrait.